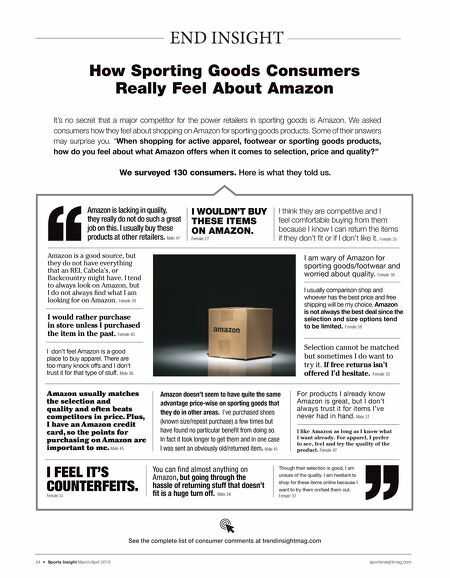 See the complete list of consumer comments at trendinsightmag.com It's no secret that a major competitor for the power retailers in sporting goods is Amazon. We asked consumers how they feel about shopping on Amazon for sporting goods products. Some of their answers may surprise you. "When shopping for active apparel, footwear or sporting goods products, how do you feel about what Amazon offers when it comes to selection, price and quality?" How Sporting Goods Consumers Really Feel About Amazon END INSIGHT I would rather purchase in store unless I purchased the item in the past. Female 45 Amazon is lacking in quality, they really do not do such a great job on this. I usually buy these products at other retailers . Male 47 I think they are competitive and I feel comfortable buying from them because I know I can return the items if they don't fit or if I don't like it. Female 35 I am wary of Amazon for sporting goods/footwear and worried about quality. Female 36 I don't feel Amazon is a good place to buy apparel. There are too many knock offs and I don't trust it for that type of stuff. Male 36 You can find almost anything on Amazon, but going through the hassle of returning stuff that doesn't fit is a huge turn off. Male 34 I FEEL IT'S COUNTERFEITS. Female 33 Amazon is a good source, but they do not have everything that an REI, Cabela's, or Backcountry might have. I tend to always look on Amazon, but I do not always find what I am looking for on Amazon. Female 39 I WOULDN'T BUY THESE ITEMS ON AMAZON. Female 27 Selection cannot be matched but sometimes I do want to try it. If free returns isn't offered I'd hesitate. Female 35 I usually comparison shop and whoever has the best price and free shipping will be my choice. Amazon is not always the best deal since the selection and size options tend to be limited. Female 58 Though their selection is good, I am unsure of the quality. I am hesitant to shop for these items online because I want to try them on/test them out. Female 37 Amazon doesn't seem to have quite the same advantage price-wise on sporting goods that they do in other areas. I've purchased shoes (known size/repeat purchase) a few times but have found no particular benefit from doing so. In fact it took longer to get them and in one case I was sent an obviously old/returned item. Male 45 Amazon usually matches the selection and quality and often beats competitors in price. Plus, I have an Amazon credit card, so the points for purchasing on Amazon are important to me. Male 45 I like Amazon as long as I know what I want already. For apparel, I prefer to see, feel and try the quality of the product. Female 47 For products I already know Amazon is great, but I don't always trust it for items I've never had in hand. 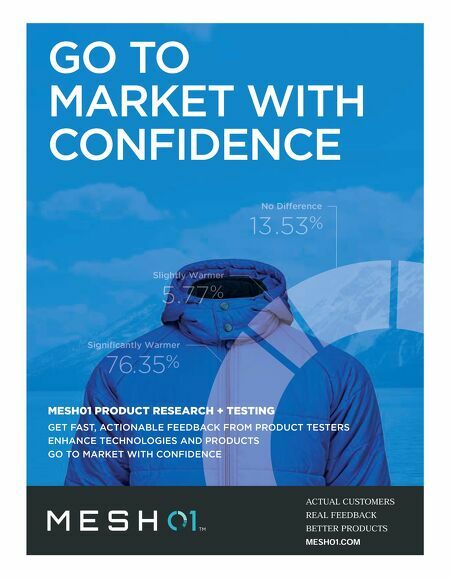 Male 37 34 • Sports Insight March/April 2019 sportsinsightmag.com We surveyed 130 consumers. Here is what they told us.